It’s good to have some level of anxiety. We don’t perform at our best in jobs, interviews, speaking and so on if we are too laid back. We need something to keep us on our toes. But some people suffer from crippling anxiety disorder. It goes far beyond a reasonable response to a challenging situation. It leads to panic attacks, fear of going out, being afraid to pick up the phone. You may even be afraid to sleep. It is seriously disabling. This book seeks to address these problems sensitively. There are pages about causes, symptoms, managing the illness, treatment and how others can help. Each page of information and advice is accompanied by a relevant prayer on the facing page. Part A is for, or on behalf of, those who have anxiety disorder. Part B is for family, friends and the wider community. There is a page of resources at the end. Half the royalties go to the mental health charity Mind. Another common symptom of anxiety is a pounding heartbeat. This can be frightening, as if you weren’t already anxious enough. You fear something is seriously wrong. You’re afraid you are having a heart attack. Ask your doctor to check that there is no physical problem with your heart. The likelihood is that this is a natural symptom of anxiety. If you can bring that under control, then the racing heartbeat will go too. Tell your doctor about this larger problem. You may be prescribed treatments to help. Assure yourself that the pounding heartbeat may feel like a heart attack, but it isn’t. There are things you can do when you feel the symptoms coming on. A racing heartbeat is often associated with difficulty in breathing or hyperventilation. Learning to breathe deeply and slowly can be a tremendous help. Your body will respond positively if you go for a walk. This helps to steady your pulse and your breathing. It may help to call a friend for reassurance during an attack. You will be less frightened of being taken ill alone. Panic attacks begin to subside naturally after ten minutes or so. Tell yourself you only have to get through that. You know how often my heart goes racing out of control. I’m frightened there is something very wrong with me. I’m going to die. Place your steadying hand upon my shoulder. Talk to me in calm tones of commonsense. Part of my brain knows that this is just a symptom of my anxiety. My body doesn’t feel like that. Help me to take control of my body and mind. May your Spirit dwell within me, calming my fears. Remind me how to control my breathing. Let me feel my whole body relax under your reassurance. Strengthen my will to do everything I can to heal my anxiety and to practice those things which will help me relax. You have given me a life to lead and a service to do for you. Steady my heart that I may be a useful disciple of your kingdom. Rest your calming hand on the one I bring before you. The world crowds in upon them and they fear it. Grant me the grace to be part of your peace and healing. Save me from rushing in with hasty answers. Let me learn to understand how this disorder feels. Give me patience when I’m itching to suggest solutions. May my presence be a time that they look forward to. Grant me the humility to listen more than I talk. Show me how to bring a little sunshine into their life. Let us do enjoyable things together, while freeing them from the anxiety of planning anything. May they trust me in a world that seems hostile. 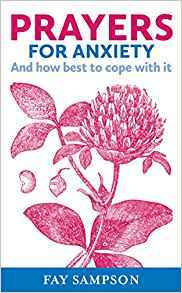 I know, as you do, that there are ways for people with anxiety to cope. Grant me the wisdom to sense when the time is right for advice, and to go gently until then. Be a friend to both of us as I help them to move forward. The positive response to Prayers for Dementia and Prayers for Depression encouraged my publishers and me to look at more of the crippling conditions which affect so many people. In our image-conscious society, where social media play such a big part in many people’s lives, anxiety levels are rising, even among children. We are afraid we won’t measure up to what others expect of us. We don’t feel sufficiently liked. This can haunt us so much that we back away from society and retreat into ourselves. Anxiety often causes distressing physical symptoms: breathlessness, raised heartbeat, panic attacks. With the aid of the excellent charities that offer help to anxiety sufferers, I wanted to reach out and offer hope and reassurance to those disabled by this condition. I also wished to create a better understanding in those who live with, or care about, someone with anxiety disorder. I found it natural to express these concerns in prayer, as well as in factual information. I have tried to enter sensitively into the minds of those with anxiety, those closest to them, and those in the wider community who would like to know how to help.